Motor vehicle collisions cause most back and neck injuries. Falls account for a large percentage of others. Lifting at work is also a frequent cause. The most common location of a spinal injury is the lower back because it supports so much weight. The spine consists of 24 articulating vertebrae and nine others that are fused. The articulating vertebrae are separated by spacers called discs. The articulating spine is divided into separate sections. There are seven cervical vertebrae in the neck, twelve thoracic vertebrae in the middle of the back, and five lumbar vertebrae in the lower back. The spine houses and protects the spinal cord. The most serious injuries to the spine involve the spinal cord. The spinal cord is made up of nerve tissue formed in a long bundle extending from the brain down the spine to the first or second lumbar vertebra. From the spinal cord, 31 pairs of spinal nerves emerge. The brain and spinal cord make up the central nervous system. The spinal cord integrates and coordinates information that it receives from virtually every part of the body. Most injuries to the back and neck are strains or sprains that usually resolve with conservative treatment over time. Average recovery time for a common back or neck strain/sprain is a month to six weeks. These are known as acute injuries. Other back and neck injuries might involve displaced and/or herniated discs, which require surgery. These injuries are chronic in nature. For these conditions, the disc or part of it might be removed. An artificial disc might be implanted, or the spine might be surgically fused to reduce instability. 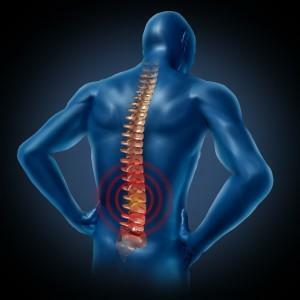 Spinal cord injuries are the most serious back and neck injuries. They occur when part or parts of a vertebra are damaged, dislocated, or fragmented. The damage can affect the central nervous system, and prevent messages sent by the brain from being received by other parts of the body. The messages just stop at the level of the damaged vertebra. This results in paralysis below the level of the damaged vertebra. If the injured person received an incomplete spinal cord injury, they have some control over an extremity below the damaged vertebra. If you sustained a back or neck injury because of the negligence of another person or entity, you could be compensated for damages. These could include your medical bills, rehabilitation costs, past and future lost earnings, permanent disability, and pain and suffering. We help victims receive compensation for their back and neck injuries. We’ve helped protect and advocate for the rights of these victims while building successful cases for them. Call us today or fill out our online contact form, and we’ll get back to you within 24 hours.